The handles on these adaptive utensils enable individuals with limited grasping and hand strength to enjoy a meal independently! The adaptive utensils are especially beneficial for people with arthritis or recovering from a stroke. The pain and stiffness of arthritis and the neurological affects of a stroke make it difficult to hold a spoon or fork. However, the handle on these special utensils are designed to eliminate this problem. The size of these soft, foam handles are 1.5 inches in diameter, making the handles easier and more comfortable to grasp. 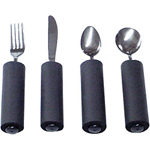 If grasping difficulties improve, the foam handles can be removed and used as normal utensils. Without the foam handles, the utensils become an attractive, 4-piece flatware set. The knife blade, spoon bowls and fork tines are made of quality stainless steel. The utensils are lightweight, weighing less than 2 ounces each, and are between 8" and 9" inches long (depending on the piece). The durable plastic handles are 5/8" in diameter and dishwasher safe without the foam handles. Set of four utensils: fork, knife, teaspoon and soup spoon.